* Please note that when taking Route 128 South, continue until Route 1 South, from Route 1 South please take 129 East to Goodwin Circle. The Lynn Memorial City Hall and Memorial Auditorium are listed with the National Register of Historic Places through the United States Department of the Interior. The information below is summarized from NRSH documentation. The full document is available for download below in Acrobat PDF format. Generally conforming to the shape of its lot, Lynn Memorial City Hall and Auditorium has a unique six-sided, symmetrical footprint that is approximately 262 feet wide at the three-part facade, 184 feet deep, and 95 feet across the rear elevation. The steel-framed structure has a reinforced, poured-concrete foundation that rests on concrete footings. The frame is covered with large buff-colored Indiana limestone slabs laid up with narrow mortar joints that are only visible on close inspection so that the building appears to have a smooth limestone skin. A course of large granite slabs that match the limestone in color runs along the foundation. The building rises three full stories above a ground floor (now known as the first floor) and a subterranean basement so that there are five interior floors. Two small penthouses, one for the elevator, and a limestone chimney rise through the flat roof, which was originally covered with five-ply tar and gravel, but is now rubber membrane. The symmetrical, three-faceted facade (south elevation) is arranged in a wide V with its point flattened by a canted colossal entrance bay flanked by nine-bay “wings.” The cornerstone of the building, located at the southeast corner of the facade, is a limestone slab incised with the date 1948.
upholstered seating, but most of the furniture in the municipal offices is metal. While utilitarian finishes generally characterize interior spaces, there are six types of marble (Laredo Chiaro, Bottino, and Travertine from Italy; Black Belgium from Belgium; Renfrew from England; and Tennessee from the U.S.) and five hardwoods (teak, mahogany, maple, birch, and oak) in the most important offices and public spaces. Bronze is used for most of the hardware throughout the building. The decorative and emotional centerpiece of the building is the monumental Memorial Lobby. Intended to serve a dual purpose, it was designed as the main entry to the municipal offices as well as the auditorium. In contrast to the utilitarian finishes of the office corridors, the lobby is lavishly finished with floor to ceiling, highly veined, buffcolored, Italian marble. Five pairs of recessed entry doors, three centered on the facade plus one on each side of the central grouping, lead into the ceremonial space. (The central pair of doors is now boarded and labeled exit only.) Rising above the three central doorways is a twenty-foot tall window that lights the interior. A grand stairway opposite the entry leads up to a second level of the lobby, which is officially known as the foyer. The Italian marble continues along the walls of the stairs and foyer. Occupying the core of the building on all four floors, the auditorium is composed of orchestra and balcony seating, the stage, an orchestra pit, a projection room, and dressing rooms. The latter are located beneath the stage on the first (ground) floor. Total seating capacity is 2072, with 1245 seats in the orchestra section and 827 in the balcony. The dimensions of the auditorium are 120 feet wide across the entry off the foyer, 40 feet wide across the proscenium arch, and 93 feet deep from the entry to the orchestra pit. Nine doors lead into the auditorium—two on each side and five at the south end. The central three doors at the south end are the main entry doors from the Memorial Lobby and Foyer. All doors are finished with a sage green paint and inlayed with two vertical brass strips. A five-to-six-foot-tall, wood panel wall separates the seating area from the entry vestibule, which spans the south end of the auditorium. Two finely crafted original brass drinking fountains are recessed into the south wall of the vestibule. 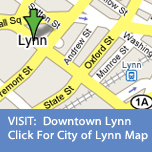 The City of Lynn has been governed by fifty-seven City Mayors since its incorporation in 1850.